That’s what I wanted. I wanted to see power forward Tim Duncan’s big smile after his fifth championship with the San Antonio Spurs. The man is known for his stoicism, so a wide, radiant smile is a rare thing. Some teams are lovable and some teams are hateable (*cough, Yankees*). The Spurs are loveable for their ethos. They are known for civility, humility, and for unselfish team play. Sunday’s game in San Antonio was a thing of beauty. The intricate passing, the way players set their teammates up to succeed, all epitomized the Spurs’ system. The Spurs beat the Heat 104–87 in Game 5. They won the NBA title that slipped away in last year’s heartbreaker against the Miami Heat. Afterward, Duncan sat with his two children nearly glued to him. It was an endearing Father’s Day image. His small daughter and even smaller son kept nestling closer and closer, as the big guy refrained from gloating. He told a reporter that the Spurs were not as fast or as athletic as the Heat, so their strategy was to keep the ball in motion in order to compensate. Praising the opponent. Downplaying the Spurs. As if it was simple. As if the passing and the team play was anything less than highly honed skill and great coaching. Spurs Point Guard Tony Parker credited Duncan’s unselfishness and humility with inspiring his own. During the championship series and the final game, Parker did his best to help younger player Kawhi Leonard shine. Leonard was named Most Valuable Player. Sports, competition, the workplace, the battlefield, the boardroom, the classroom, all provide chances to show character. Friction and conflict, trying to achieve something, bring out the ego or the hero. 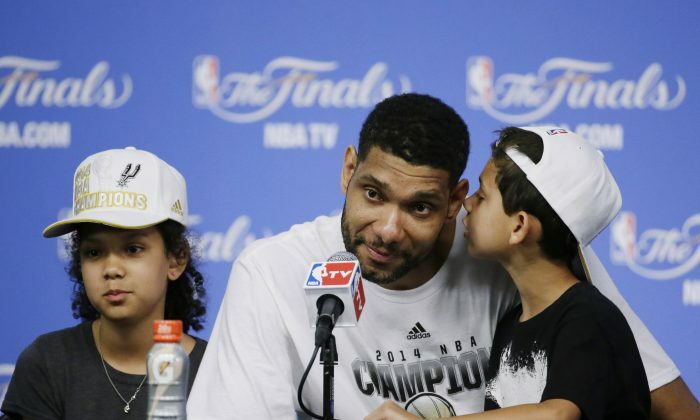 The Spurs, with the leadership style of Timmy, are ego-free, and that is their great strength. Sports are one the few things in American life that still belong to everyone. It is universal, not in silos built for various members of “our patchwork nation,” as Dante Chinni, author of the book of the same name, calls it. Liberals may eat at Whole Foods while conservatives enjoy Cracker Barrel, but we all share baseball and football and basketball. Yet those American pastimes are often tarnished by crimes and scandals. So, to have the nice guy Spurs finish first, ah yes. For one night, all was right in our republic.